Our Kava export into the USA has been identified as having the potential to grow exponentially to generate around US$15 million (FJ$32.6 million) in export earnings. Acting Permanent Secretary for Agriculture, Uraia Waibuta, said the current demand for Kava in the US alone is around 10 tonnes per year. He said this has the potential to easily grow to 20 tonnes easily, as other market segments are explored. Mr Waibuta is currently heading a Fijian delegation on a Market Scoping Missing in USA. 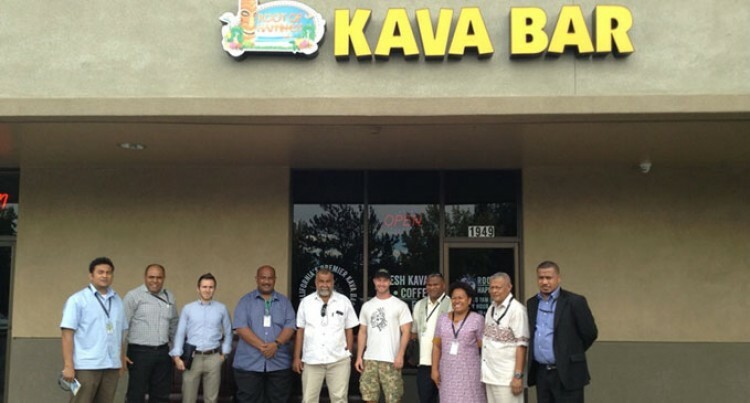 The potential was identified following a meeting between the delegation and key Kava importers in California. Mr Waibuta said that one of their highlights was the visit to a modernised Kava Bar in Sacramento called the ‘Root of Happiness Kava Bar’. “This is Northern California’s first Kava bar which opened its doors in March 2013 and has been frequented by the diverse American consumers,” he said. “We have witnessed this very modernised set up of a Kava Bar. It has redefined the kava bar as we know it in Fiji. It is designed to target the American customers and its expanding market. “Even more surprising was the owner, Tyler Blythe, said 90 per cent of his customers were Russians who were interested in the serene atmosphere and the soothing effect of kava drinks. Mr Blythe is the head of the American Kava Association. He said all Kava entering the United States will need to be cleared by the Food & Drugs Administration (FDA), analysed of its chemical compositions, especially the Kavalactone level. This was to ensure that products served to the customers were safe for consumption. Looking at this big market potential, Mr Waibuta has encouraged Fijian farmers to grow more Kava to fulfil the demand in the export market, particularly the US. The current production for Kava in Fiji is around 4000 tonnes from a total area of 1300 hectares which he said needs to increase. “The Ministry of Agriculture will increase its efforts to support the Kava industry,” Mr Waibuta said. The Ministry he said, will further strengthen its collaboration with its partners. This will be in establishing kava nurseries around key areas in Fiji, so farmers can access good quality planting materials and more importantly the variety that is demanded by the market. PHAMA, the Pacific Horticultural and Agricultural Market Access, an Australian and New Zealand government funded programme is now helping the Ministry and industry in the development of the Fiji Yaqona (Kava) Quality Manual. Mr Waibuta said this development will help farmers and exporters identify the 13 noble kava varieties in Fiji, areas in which these Kava varieties are cultivated and also laboratory tests on which varieties have the best kava lactone level. “Public awareness material such as posters documenting production, processing and a national kava standard based on food safety are also being developed,” he said. “So, Kava is already entering another boom and with the Fijian Government support from 2016 we envisage positive interest and an increase in production.